Everyone watched as the bride and groom swayed flawlessly, moving to the rhythm of the music. Some people were quietly shedding tears of joy, as they had never seen anything so beautiful, while others remained mesmerized in awe throughout the couple’s first dance as husband and wife. For at that moment, everyone at the wedding reception believed in love. The blissful couple glided around on the grassy surface, not missing a step. Wait a minute! Grassy surface? Why are they on the grass?! There’s no other perfect way to complete your event than by using a dance floor rental. Think about it: If you’re at a wedding and you didn’t have a dance floor, what would you be dancing on? The grass? We would hope not. Here at Tents & Events, we offer dance floor rentals so that you can rent a dance floor, rent a stage, or rent both in Bucks County, PA, as well as other local areas. This addition will help you throw the best party, event or wedding of your life. You and your guests can dance the day and night away without having to worry about stepping on a rock or falling in a ditch. So take a moment, look around on our website and figure out which dance floor would work best for your event. 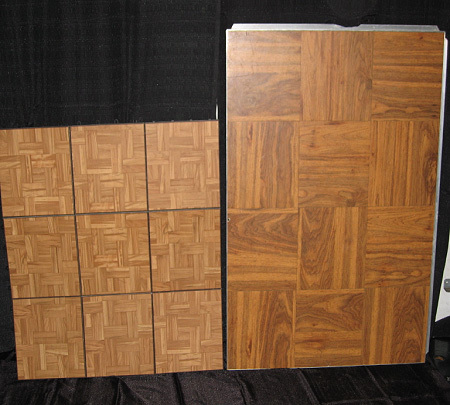 We have a variety of dance floor rental options, and we can also help you determine the size, shape and type of flooring that you need. 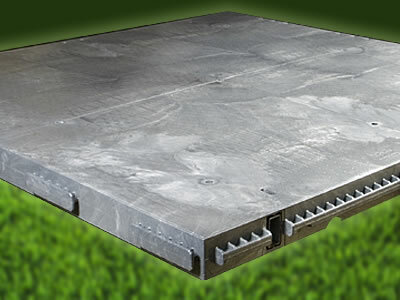 Now that you have your dance floor rental picked out, how about a stage to go with it? Fortunately, we have both options here at Tents & Events, and we’ll allow you to rent a stage as well as rent a dance floor, in case you want to add an extra dimension to your event. Whether you have an important speaker at a corporate event, a band at a wedding or a magician at a child’s birthday party, there’s no better way to allow them to speak or perform than by giving them center stage, shining a spotlight on them (optional), and giving them the reins to entertain your guests. To our team, it doesn’t matter if you have five or 500 people coming to your event. We’ll provide you with a dance floor or stage that will be able to accommodate the amount of guests. All you need to do is contact us for a consultation, and we’ll help you determine the size of the floor you’ll need for the number of people who are attending. 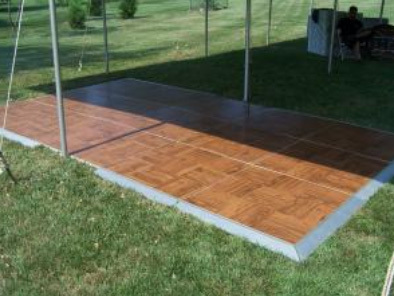 Here on our website, you’ll find a variety of different styles and sizes to choose from when it comes to dance floors and stages. You have the freedom to choose the one you’d like on your own or with the advice from our team at Tents & Events. If you want to have the time of your life like the bride and groom at the top of the page (but with an actual dance floor), please feel free to contact us today for more information about our dance floor rentals and graduation party rentals in Bucks County, PA, and the surrounding areas!